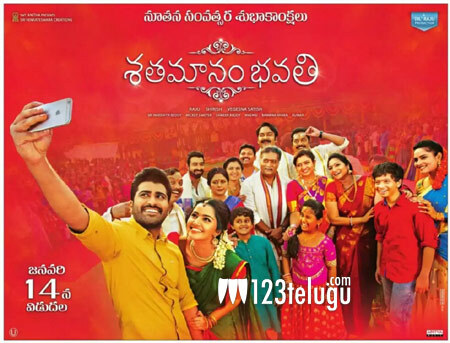 Hotshot producer Dil Raju’s latest family entertainer, Shatamanam Bhavathi, is all set for a grand release on the 14th of this month in the two Telugu states and Rest of India. However, the film’s overseas release has been advanced by a day and it will be hitting the screens across the United States on the 13th. Shatamanam Bhavathi is a perfect Sankranthi movie laced with romance and emotional drama and it is expected to strike big at the box-offices worldwide this festive season. Popular writer Satish Vegesna is the film’s director. Sharwanand, Anupama Parameswaran, Prakash Raj and Jayasudha are the film’s principal cast.